Did anybody else see the film, on the Today show this morning, of the rat running up some guy's body in the New York City subway? This is so cute! Especially the close-up. They get tame enough to jump on your lap? Be careful though that you don't get scratched or bitten. Aren't you a little worried for your cat? Chrissi, Oreo never goes outside so he and the raccoons don't ever meet face to face. Fran, I'll be careful! Promise! Chuck, I love your kitty headlight pictures! It's been a while since I posted pics of Blaze here, so I tried to take some shots with my Blackberry. The flash really did a number on his eyes! Great pics and great stories! Y'all watch them raccoons. And watch 'em close. They can carry rabies. You should use him for a flashlight Chuck! At least you'll never trip over him when you get out of bed. 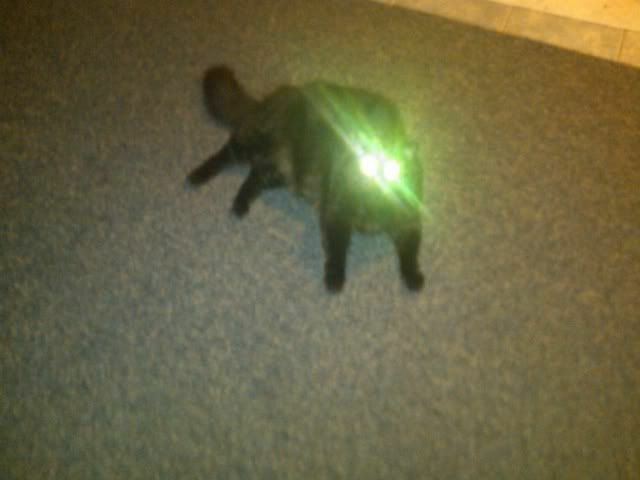 Don't we wish our kitteh's eyes shined like that all the time, huh? of a very special "Gotcha Day" at our house! 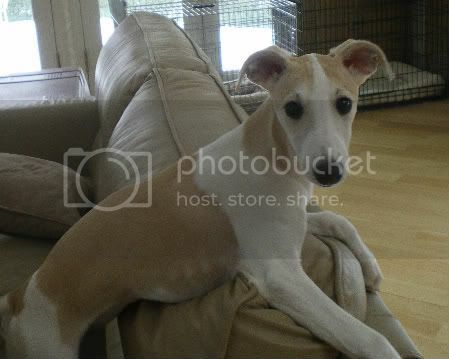 There's a new whippet at our house! She's four-and-a-half months old and a real sweetheart. I'm in heaven!